The book reflects on Williams’ personal discovery of God’s character. Williams shares scripture, interjects personal stories and challenges the reader to begin their personal journey of discovery. “Hidden Gems” also highlights what it means to be a Christian by joyfully embracing His counsel, claiming his promises and watching Him act. 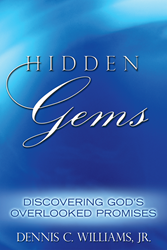 “Hidden Gems” will provide readers with a renewed spirit of discovery, compassion and services as it brings a new perspective on the many promises provided in scripture. By: Dennis C. Williams, Jr.
Dennis C. Williams Jr. graduated from Loma Linda University with a bachelor's degree in biology, earned his MBA from the University of Hawaii and is Director of Finance at a software company. He is the creator of CashMap, an interactive iPad application. Williams and his wife, Linda, have three children and live in Bellingham, Wash.